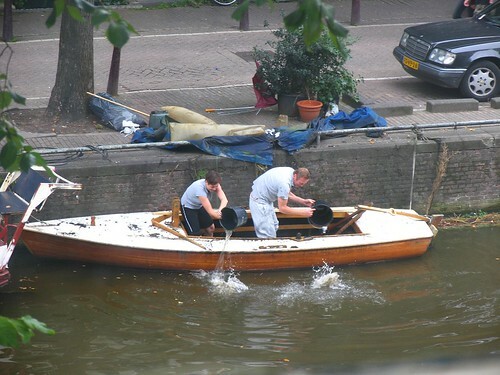 This is the reality of having a bootje in Amsterdam. You constantly have to “hozen” – bale out the water (this bootje was even covered with a tarpaulin which you can see laying on the quayside). You wouldn’t believe what foul smelling & looking fluids came out of this boat. The couple seemed to enjoy the ‘hozen’ though. Good for them. The good folks over at HoosJeBootje send us this picture. HoosJeBootje is the company you call if your boat is featured on this site. No ‘gezonken bootje’, not even those that are gone forever, they can’t get up and running again. 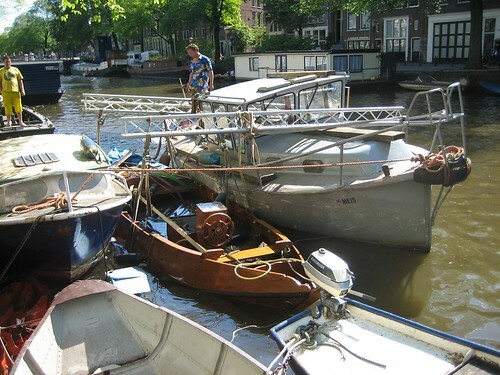 A tribute to the half sunken, the almost sunken and the definitely sunken little boats of Amsterdam.